The Catholic Church of Nigeria has maintained it’s position on Catholic priests meddling in Politics. It stated that the canon law of the church prohibits priests from participating in partisan politics. This was triggered by the face-off between famous Catholic Priest, Rev. 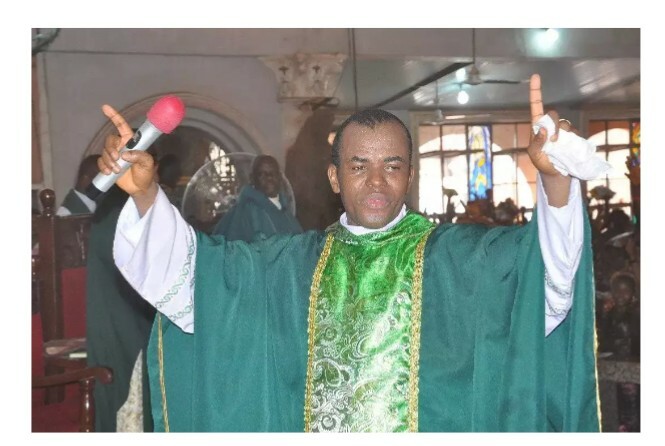 Father Ejike Mbaka, the Spiritual director of Adoration Ministries, Enugu and former governor of Anambra State, Dr. Peter Obi who is currently a running mate with presidential aspirant, Alhaji Atiku Abubakar under the People’s Democratic Party. Secretary General of the Catholic Secretariat Nigeria, Rev. Fr. Ralph Madu while addressing journalists at a press conference in Abuja on Thursday said the Catholic Church was not happy with the row between one of it’s own and a politician and has issued a directive to the appropriate quarters to take neccesary actions. Fr. Mbaka has been controversial in the last dispensation of politics over his constant involvement in partisan politics. The most recent was his online embarrassment of former Governor Obi during the church’s last Bazaar.